What do you do when you don't have enough ground surface for all your planting needs? This is a problem that drove humans to develop the concept of vertical farming. Think multistorey buildings or skyscrapers, and you have the same working principle behind the concept. Vertical farming is all about cultivating more by stacking multiple layers of planting surfaces. It is easy to see why the concept becomes highly desirable for hydroponics. Since indoor hydroponics enthusiasts often suffer from lack of floor space, vertical hydroponics is often the only choice. Vertical farming is the growing of crops in vertically stacked layers. Vertical hydroponics, as the name suggests, is the combination of hydroponics and vertical farming. So in a vertical hydroponics grow system, you will have several stacked levels, with plants being grown on each level. It is closely associated with gardening and farming in urban areas like cities. The practice is also known by several other names. Tower hydroponics, tower gardens, vertical grow systems are the most popular names. Incidentally, the practice of vertical gardening is certainly not new. It has its roots in Ancient history. The Babylonians had a similar idea when they built the Hanging Gardens in around 600-500 BC. This Ancient Wonder had flowers, shrubs and even trees growing in massive tiered gardens. In modern times, hydroponics and vertical gardening seem made for each other. Using soil as growing medium increases the weight of a vertical growing system. Hydroponics, on the other hand, can reduce the overall weight of the upper layers by at least 30%, if not more. This means that you can stack more layers. The main challenge then is in delivering adequate water+nutrients and light to plants at all the levels. The Babylonians had to use water flowing from the mountains, along with manual water screws to irrigate the higher levels. Water pumps make this task much easier in the 21st century. Providing light can be a challenge, especially indoors. If your hydroponics system is outdoors, then the ancient idea of using staggered layers is perfectly viable. But staggering levels come at the cost of additional. Indoor vertical systems can use properly positioned grow lights to create an ultra-compact, and high yield grow system. This is one of the main reasons why many experts are touting vertical gardening as the future of food production. You can grow more produce even in small indoor spaces, making this ideal for urban farming. This is, of course, a general advantage enjoyed by all hydroponics systems. But soilless growth is especially suited for a vertical system. Lack of soil minimizes the growth of weeds or pests. 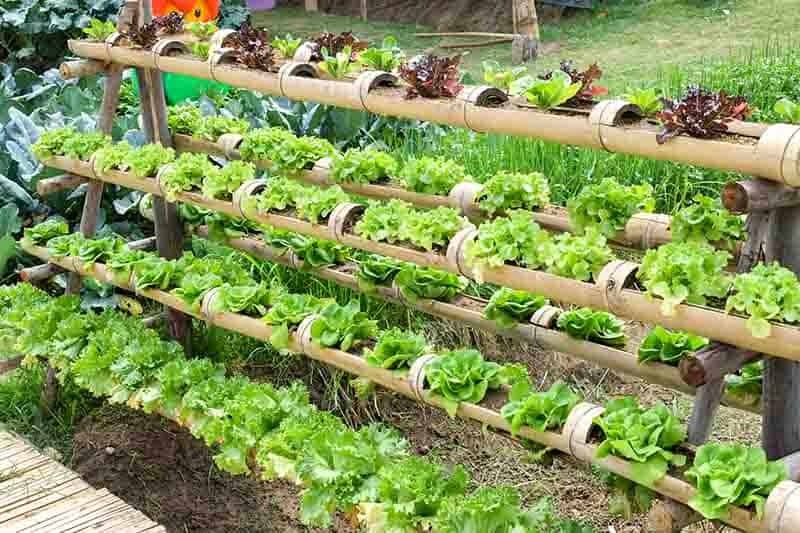 It also makes vertical hydroponics the lightest and most practical form of vertical gardening. With these systems, in the surface space required for one plant, you can grow at least 3-4, if not more. High growth can be achieved by using the right nutrient mix and proper lighting. 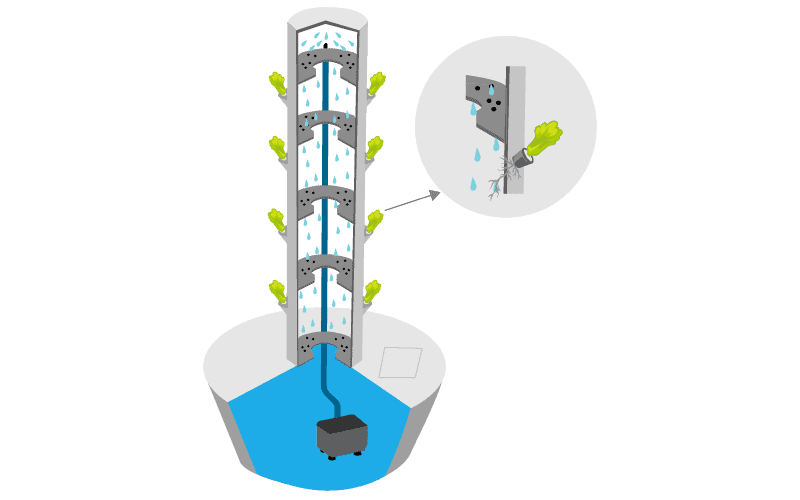 Vertical hydroponic towers typically have a closed nutrient+water flow system. There is no runoff as the water keeps circulating. This removes wastage of precious resources and nutrients. The whole process can also be automated to reduce maintenance. It is much easier to design a grow system with just a single level of plants. Delivering water and nutrients equally to all plants is not a major headache here. When plants are stacked, getting water to the top layers might require higher powered pumps. And unless carefully designed, the lower levels may get drowned. Outdoor vertical tower gardens can mitigate the problem of light supply by using a staggered design. Instead of having layers directly stacked above each other, you can space them strategically. But indoors, ensuring that all plants get the equal amount of lights can be challenging. Installing separate grow lights for each layer might the solution. Yes, you can grow more plants with vertical hydroponics. But that also means that input costs also scale accordingly. Using motors and grow lights can entail mounting energy bills. The water will also need constant monitoring in closed flow systems. But the advantages of vertical hydroponics outweigh these challenges in an era when land and cultivable soil is getting more and more scarce. 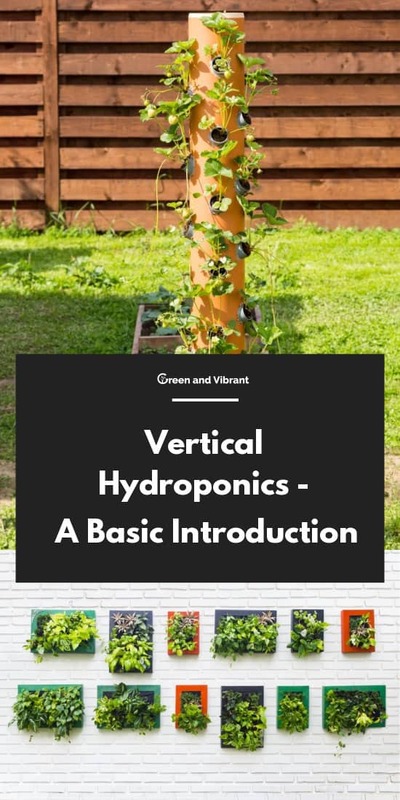 How does a Vertical Hydroponic system work? There are many different hydroponic techniques like ebb and flow and nutrient film technique (NFT). Due to the unique dynamics of a vertical system, NFT is often the easiest to do. Nutrient Film Technique involves having a constant thin stream of water flowing over the root system of the plants. This is a closed, constant flow system, which makes it perfect for a vertical tower design. In a typical hydroponic tower, the idea is to use a tube system with a pump to get water to the top layers. From there, you can use the assistance of gravity to channel the flow down to the reservoir. You can either use a single tube to deliver water to the top level or use multiple channels to different layers for optimal delivery of water and nutrients. DIY designs typically involve the use of PVC pipes or thicker drainage pipes for the central tower. On these, smaller holes are drilled at intervals to house the individual plants. The plants are usually housed in net cups to allow the water to flow through the root systems. In a tower design, the plants are grown at an angle, typically around 45 degrees. Not all vertical hydroponics systems need to use the vertical tower design. Some outdoor designs use multiple PVC pipes arranged on a trellis frame at diagonal angles. The pipes are usually in a compact zig-zag pattern going up. The plants are housed in net cups, placed in regular 90-degree angles. These systems also use NFT techniques to grow the plants. The water with nutrients is pumped to the top pipe, from where it flows down in a constant stream. With an indoor system, artificial lighting is a major concern. Since the plants in a tower vertical system are placed at an angle, the best option might be to use vertical grow lights. Panels hanging from the ceiling may not be ideal since all the plants are at different heights. The best way to circumvent is by using multiple vertically mounted lights to cover all the growing surfaces uniformly. The 5-gallon tub or bucket will be the reservoir. The PVC pipe will be placed into the tub by making a proper sized hole in the lid. You can use any length of pipe depending on the height of the ceiling in your indoor grow area. For a standard tower, five feet seems like a safe choice. Mark the PVC pipe with slots where the net cups will be placed. You can use the entire 360-degree surface area of the pipe for this purpose. The holes drilled into the sides of the cup should be large enough to house one net cup. Plan the size of the net cups according to the size of the main PVC pipe. You can cut up smaller PVC pipes to make holders for the net cups. Stick these to the sides of the main pipe to create 45 degree angled planters. Use the tubing and motor to deliver water to the top of the tower. In a rain tower system, the water then percolates down through the inside of the pipe, delivering nutrients to all the plants. What are the ideal plants for this method? Vertical hydroponics is a godsend for folks who don't have access to the soil to grow things. Vertical grow systems can significantly increase the productivity of your indoor grow areas. These days there are numerous commercially available readymade vertical grow kits on the market. They are a sure sign of the increasing interest in vertical hydroponics, especially among urban growers. Increased input costs and complexity can be a drawback, but the benefits do outweigh these limitations. 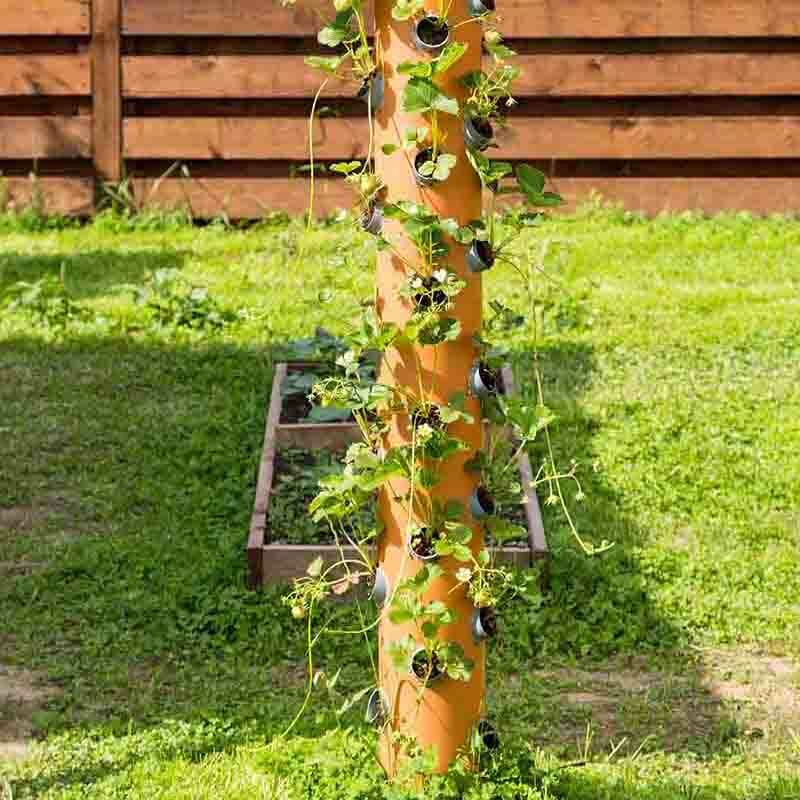 There is no doubt that vertical gardening is a vital technique for a more sustainable future.